The HSE recognise SlipAlert as an accurate portable slip assessment tool. It has a very high correlation with the Pendulum, the de facto industry standard. The Pendulum appears in British Standard 7976, SlipAlert in British Standard 8204. Read the full HSE report written over 3 year ago. Since then, the HSE have growing eveidence that SlipAlert is robust, practical and the best portable floor testing tool. SlipAlert test results speak for themselves. There is a very high correlation between SlipAlert and the Pendulum in both wet and dry conditions across a range of surfaces. The HSE in the UK now accept that SlipAlert is a very good way to test foors and that it consistently gives accurate results wet or dry. Each point of the graph corresponds to a measure of slip coefficient on a different surface as measured by SlipAlert and the Pendulum. The big advantage of SlipAlert is that it is portable, it works on both wet and dry surfaces and its so easy to use, anyone can do it. PTV 36 should be a safe floor for normal pedestrian walking. PTV 40 (co-efficient of friction 0.4) should be safe enough for running or turning. You can read the full report below or via the HSE website. 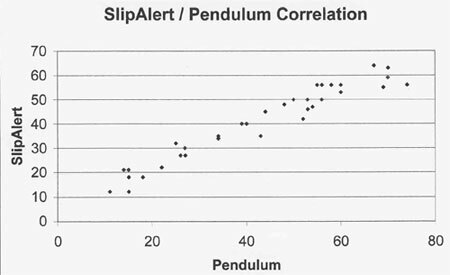 good correlation with the Pendulum test..."
"SlipAlert should be regarded as a good indication of available friction, lending itself to risk assessment, monitoring of floor surfaces and evaluating & monitoring cleaning regimes"
"SlipAlert tends to give fail-safe readings"
The visual effect is important. As you will find when you use SlipAlert, it is easy to see if an area of floor has a slip risk. SlipAlert is the best portable device we know of that will detect contamination on a floor. Contaminants change the slip resistance of a floor and many slip accidents are caused by contamination or poor cleaning. With SlipAlert you can prevent serious accidents. In 2008 the HSE Shattered Lives Campaign remind us that slips are the biggest cause of accidents and that businesses have a duty of resposibility to keep floors safe. With SlipAlert you can easily convert SlipAlert Test Values (STV) into PTV or co-efficient of friction values using the graph on your SlipAlert ramp (see above image). You will see that STV 130 corresponds to PTV of about 40 (co-efficient of Friction about 0.4) which is slip risk of approximately 1: 1 million and considered safe. STV of 173 eqautes to PTV of 20 (0.2 CoF) slip risk masively larger at 1:20. PTV and CoF align failry well up to PTV 50 (CoF 0.5), but above this values most floors are safe enough. The TRL Pendulum is also known as Pendulum Skid Tester because it is also used to test road slip risk. Values or PTV 45 or more will be required and some roads need PTV 65 or more. Contact us on +44 (0) 1923 858323 for full details. PTV of 36 is equivalent to a slip risk of 1:1million according to estimates done in 1950's in UK. Some prefer PTV 40 for safety where people may be walkig fast, running, turning or twisting. SlipAlert measures better than STV of 130 should be considered safe. PTV of 24 is considered the minimum value for public flooring COF 0.24 or STV or 173. This equates to approximately 1:20 slip risk. Far too high a risk in a public building with many pedestrians. CoF values up to 0.4 match well with equivalent PTV 40. So a CoF of 0.36 is considered safe for normal walking. Some say that for sports halls the dry PTV should be 65 or better to allow for socks, bare feet, and trainers and fast moveing people. Thought should be given to the wet slip risk, because if your sports hall may get wet (and most do) then sacrificing wet slip risk to acheive PTV 65 in the dry is not a good idea. If your customers care about floor safety then you and they may benefit if you demonstrate the value of SlipAlert and how it can improve cleaning, and improve floor safety. You can use SlipAlert to prove the effectiveness of your cleaning regime or to test a new foo surface or test a floor treatement.Most importantly you can use slipAlert to unshatter lives. if you'd like to try slipAlert please contact us.